Home / homeschooling / How to Make an Apple Pie & See the World / KNOW / learning / letter sounds / My Father's World / My Father's World K: A is for Apple & Rowing "How to Make an Apple Pie and See the World"
My Father's World K: A is for Apple & Rowing "How to Make an Apple Pie and See the World"
I never know exactly how the boys (and I) are going to take hold of the units we do and it is always interesting to see whether we will decide to go deep or wide in our learning. 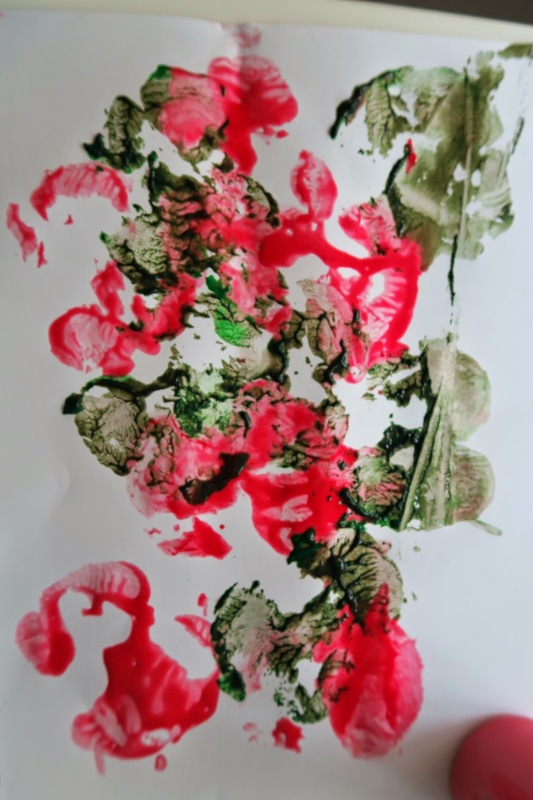 We have evolved a kind of easy, fluid structure, which uses the letter sounds and their related topics from My Father's World K as a base, and then develops them from there. This time round, I decided to "row" a Five in a Row book to start the unit off. 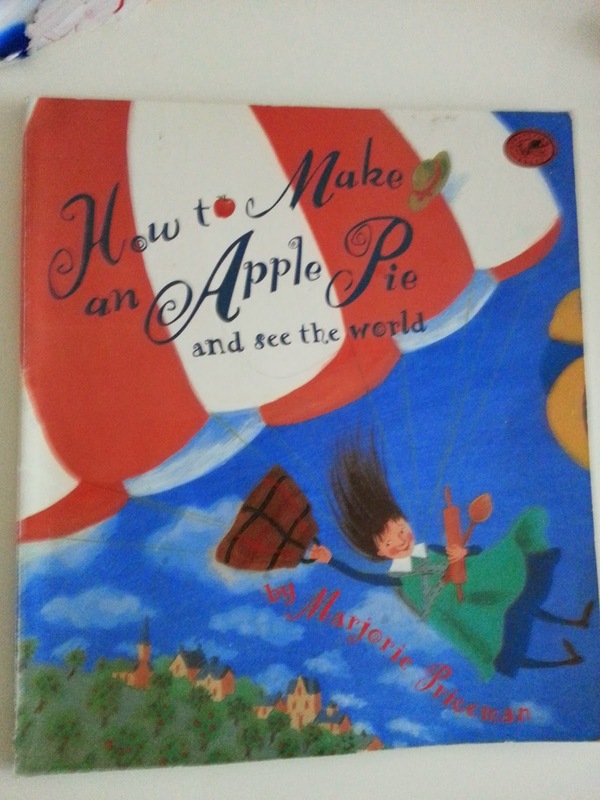 How to Make An Apple Pie and See the World by Marjorie Priceman is a lovely book about a girl who goes to the shop to buy ingredients for an apple pie, only to find it closed, and she then proceeds to travel around the world on various modes of transport to obtain them from their sources. It's a very interesting book about food provenance, or where our food comes from. We started off with our first Geography lesson on the names of the continents. 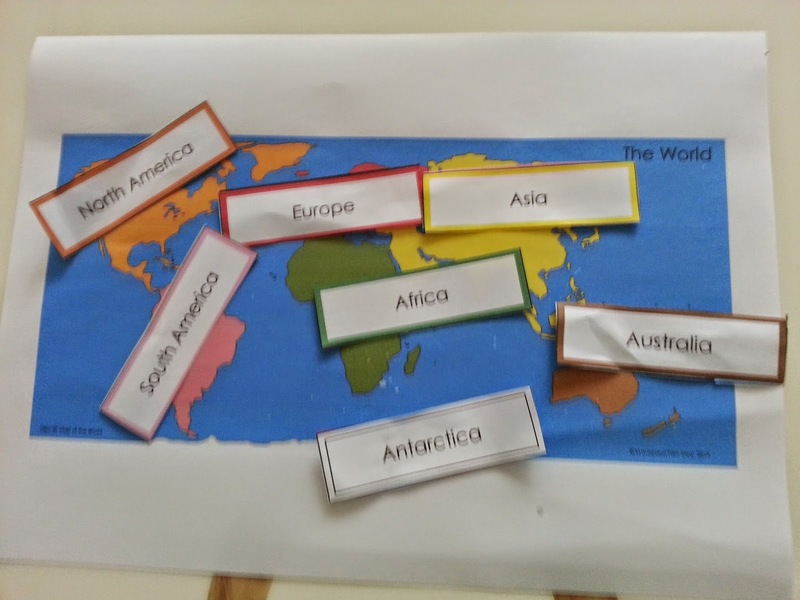 We used the Montessori method for this activity and sang the Continents song while labelling the different continents on the map with the help of some colour-coding. I purchased a soft copy of the maps and labels from here at a very reasonable price. The boys really loved the song! "Europe, Asia, Africa..." They have been singing it all the time since then. I will be revising the song and map with them again so that they will really know the continents by heart by the end of the year. The next fun part - going through the story after the first reading, and arranging in chronological order the countries the narrator went to, the modes of transport, and the types of ingredients that were sourced! This was a good recall activity and it served as preparation time for the making of our own apple pie as we assembled the actual ingredients we would need from the kitchen. For example, the narrator took a ship to Italy to get wheat to grind into flour. Cinnamon was obtained from Sri Lanka, which they went to on a banana boat. Apples were picked fresh from Vermont! Of course, they had to take a plane there. The fun part came in assembling all the ingredients we would be using to bake our very own apple pie! The pièce de résistance of the unit was an actual recipe for apple pie in the back. I had my reservations about whether it was a good recipe, but thought we should try it anyway. It turned out to be one of the best apple pie recipes I have tried! Z was a very proud little boy with our dearest guests that evening, serving them the apple pie he had helped to bake earlier that day. Here he is with Uncle Ben and Aunty Sonia. We also did some apple crafts for the unit. 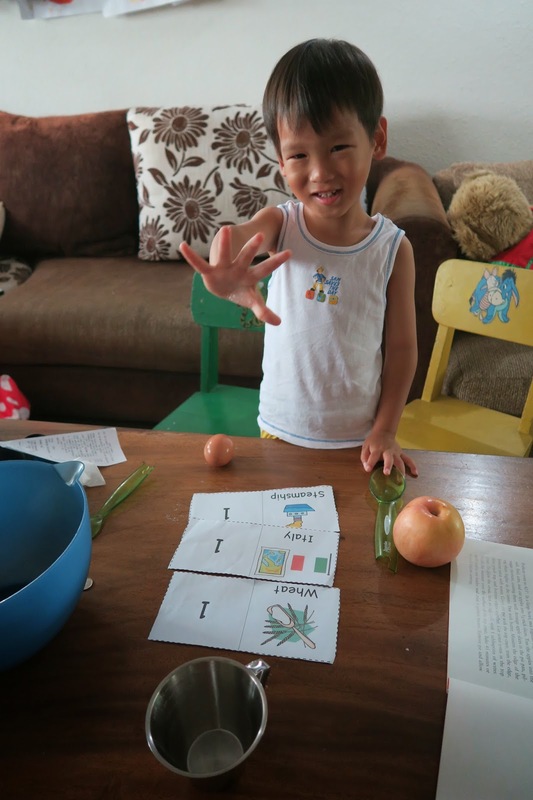 Here is Z doing an apple collage. 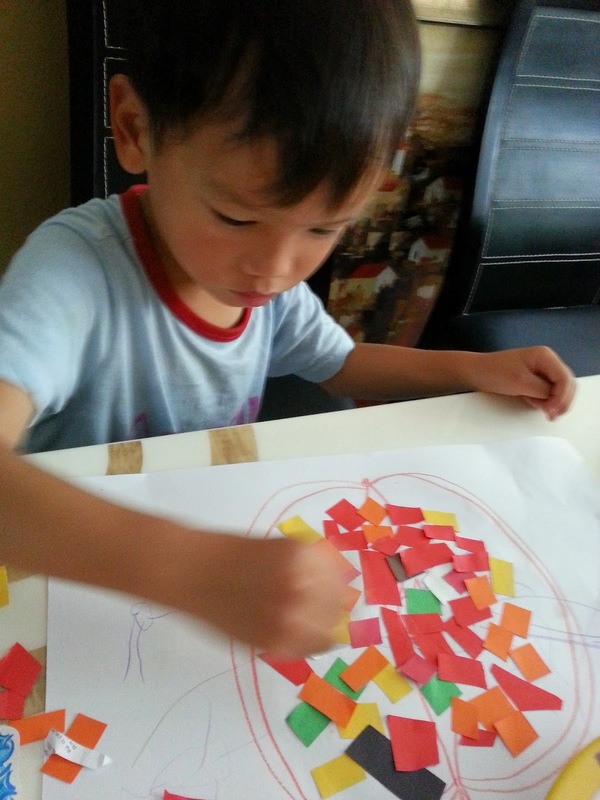 This activity is great for fine motor skills. 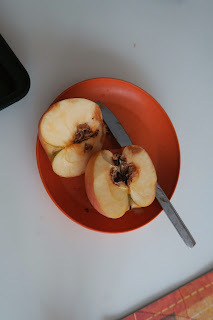 We also did some apple printing, I was strangely quite pleased when we found out that the apple I was going to use for the activity had a rotten core. 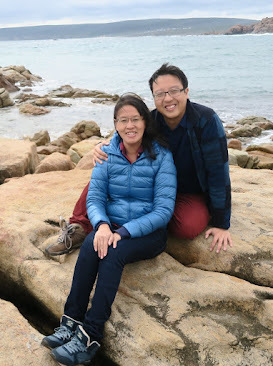 We had a good discussion on how appearances are deceiving. An apple can look good on the outside, but what matters most is the heart of the apple. We were reminded to keep our hearts pure in God. A great object lesson! This was another great activity for fine motor skills. Another sensory activity we did was to create our own Apple Pie Playdough. 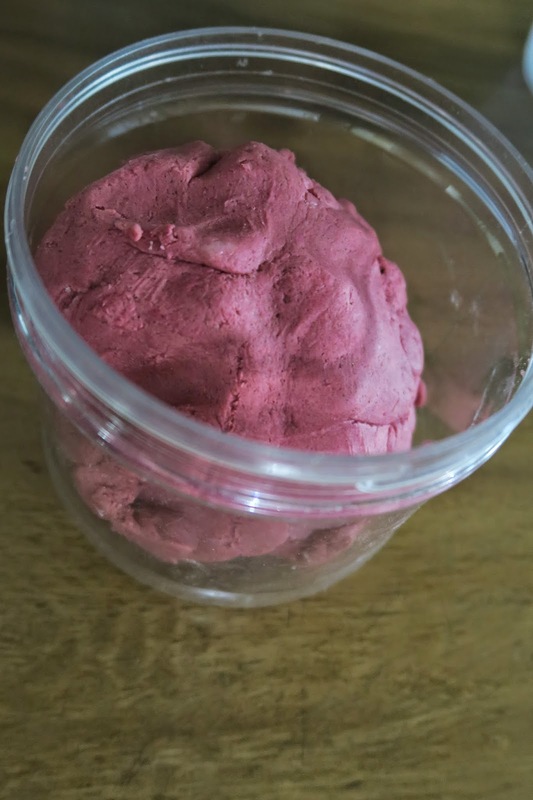 I got this lovely idea from The Nurture Store's post on Fall Play Dough, made with different spices like clove and nutmeg. Spicy, warm scents. We made ours with nutmeg and cinnamon, and it still smells lovely a few weeks down the road. When it was done, I gave E some paper leaves and green chenille stems, and he enjoyed making his own apples and selling them at an "apple stand". We then added some Math into the unit with a printable which involved counting and drawing apples in a basket. It was with a slight sense of sadness that we ended our Apple Unit; especially since we really did enjoy it so much. We loved the books we borrowed from the library and especially One Green Apple, which we did an extension lesson on. More on Eve Bunting's One Green Apple here!